Never judge a book by its cover and that saying definitely applies to this homestand for the Flames. In five consecutive games at the Scotiabank Saddledome spread over the first two weeks of December, Calgary made it a perfect 5-0-0 in stunning fashion Saturday night with an equal parts exhilarating and equal parts infuriating 5-4 overtime victory over the New York Rangers. If you didn't know any better, you might look at the perfect record and think the Flames steamrolled their opponents with ease. Um, not so much. In one of the odder homestands I can remember, it very easily could have finished 2-2-1 or worse but instead, aided by some Johnny Gaudreau slight-of-hand, they magically emerged with the maximum 10 points while leaving behind a long line of stunned and cursing hockey writers, trying to make sense of it all -- and desperately trying to still meet deadline. Trailing 3-0 after two periods to the NHL's best club at the time -- the Dallas Stars. No problem. Trailing 4-3 with just a few seconds remaining to the red-hot Boston Bruins. No worries. Multiple blown leads against the division rival San Jose Sharks as well as the much improved Buffalo Sabres. Relax, we got this. Ranked dead last in the NHL as recently as a week ago, the Flames faced all sorts of adversity yet somehow emerged unscathed. It's the fifth time since the Flames moved to Calgary in 1980 that they've won nine consecutive games at home and just the second time since 1991. The franchise record is 10, set Nov. 7 - Dec. 12, 2006. OK, we didn't just learn this. We've known this for a long time but the point was certainly re-stated over the course of the five games in which Karri Ramo played the first three and the less sick Jonas Hiller played the last two. The Flames save percentage for the homestand was a below-average .899 (Ramo, .910 and Hiller, .881), which is not very good for the AHL, never mind the NHL. Now to be fair, Hiller wasn't feeling well for either game, especially the Buffalo game, so to some extent you can give him a pass but the entire body of work for Hiller this season has not been good. The 33-year-old ranks last in the NHL with a .862 save percentage. Next closest is Carolina's Eddie Lack (.876) and Edmonton's Cam Talbot (.889). How they were able to win five games despite sub-par goaltending is plain old lucky and is a perfect example of that word that makes Flames fans cringe -- unsustainable. Some nervous fans have already expressed this worry. 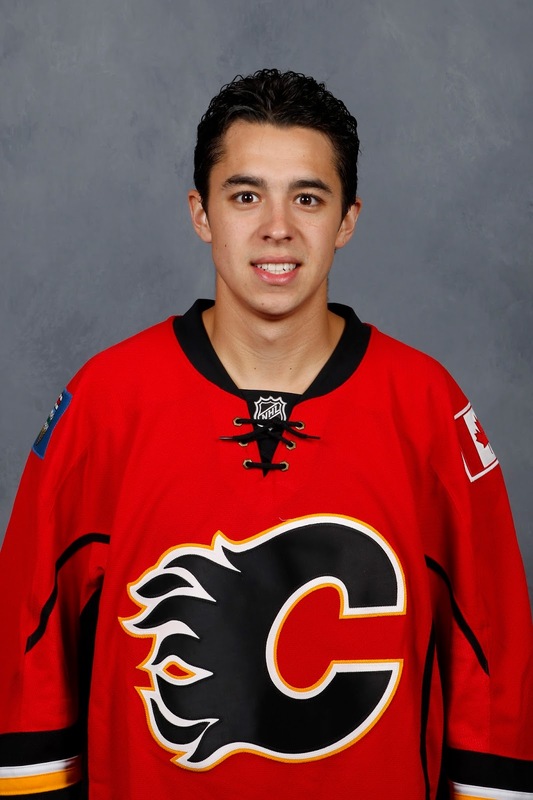 Would Johnny Gaudreau prefer to play on the East coast and be closer to home? Well, maybe at some point in his career the New Jersey kid will end up back in that part of the U.S. but let's be very clear on one thing, he's not going anywhere for a long, long time. Of course, the flip side to this is Gaudreau has been stifled on the road by comparison. In 14 road contests, Gaudreau has been limited to seven points (2 goals, 5 assists), which ties him for 126th in the NHL. The group he's tied with at seven road points includes guys like Alex Burrows, Torrey Mitchell, Nick Leddy, Ron Hainsey, Oscar Klefbom, Jean-Gabriel Pageau, Colin Miller and Mattias Janmark. The Flames have young kids still learning and we saw plenty of learning experiences during the homestand. Against Boston: It was 22-year-old Dougie Hamilton coughing up the puck late in the third period while on the power play and then hooking Brad Marchand resulting in a penalty shot goal that would have been the game-winner it not for Jiri Hudler's goal with 1.2 seconds remaining. Against Buffalo: It was back-to-back bad penalties by 19-year-old Sam Bennett to open the third period that led to two power play goals for the Sabres and a suddenly tied hockey game. Against New York: Bennett got caught in the corner on Boyle's goal that drew the Rangers to within one. It was 22-year-old Markus Granlund that took a high-sticking penalty with 1:45 left in regulation that led to New York's tying goal. Flames coach Bob Hartley knows his young players are going to make mistakes but they are key players for the organization and Hartley will keep playing them, knowing that it's through experience that they will get better. "Sean Monahan, Sam Bennett, Johnny Gaudreau, Dougie Hamilton, Markus Granlund, Ferly, they're all kids... but that's the commitment we made as an organization two years ago and it's why we keep playing those kids," said Hartley after Saturday's game. "Sometimes there are cheap lessons and sometimes there are very expensive lessons. If we would have lost tonight's game, it would have hurt a lot. But we managed to come back so it's a lesson learned and that's what you call experience. You have to put those young players in situations where they'll fail and where they're going to succeed and at the same time, they're going to learn and that's the way we're going to be a better team." 4. Don't Pack it in Early. Ever. Three-goal third period comeback against Dallas, followed by a shootout winner. Two blown leads by the Flames against Boston, and one for the Bruins, who were 1.2 seconds away from victory before losing. Calgary blows third period leads of 2-0 and 3-2 against Buffalo before getting the winning goal from Gaudreau with less than five minutes left in regulation. A 1-0 game late in the second period against New York ends up 5-4, the Rangers with three goals in a row in the final 15 minutes to tie it. If you're watching this team whether it be on TV or live, never underestimate the Flames ability to come from behind in games, or to spectacularly blow a big cushion. Calgary blew seven leads during the homestand, which is an outrageous number to have gotten away with. The Flames went 1-for-19 with the man advantage on the homestand. Added together, they spent 32:08 at 5-on-4 during the five games and scored once on 27 shots on goal. The lack of 'power' in the power play is killing this club. Calgary started fast against the Rangers but early momentum went out the window when the Flames got a power play four minutes in and squandered it. By that, I'm not just talking about failing to score only but being unable to set up and generate any pressure at all, which had they been able to do may have kept New York on their heels rather than giving them back the momentum. It's no surprise that the NHL's worst power play at a meager 11.6 percent (Arizona is 29th at 14.7 percent) has produced the fewest power play goals at just 10. The Flames are on pace for 28 power play goals on the season as a team. For some historical context, that would be three fewer than the 31 power play goals Joe Nieuwendyk scored by himself during his rookie season in 1987-88. There's no roster space at the moment but you wonder if there is some desire to try Jakub Nakladal on the power play at some point given how comfortable he looks quarterbacking the power play in Stockton. But unless there is a trade or an injury or two, it's going to be hard to get the veteran Czech to Calgary. I thought I was being bold in my predictions piece at the start of October when I said the Flames would win 12 games in overtime. Heck, they're already over halfway there and the season is just over one-third old. "On the bench, we feel that the two points are already in the bank," Hartley said on Saturday. "The guys are voting for Johnny. They're spraying him with water before he even got on the ice. Johnny is trying to get ready. It seems when we get into OT, there's no pressure. It seems that we know we're going to win and the guys are getting it done and the guys deserve unbelievable credit." Meanwhile, perhaps the most bizarre stat of them all is regarding the Flames goaltending that has been incredible in overtime and way better than in regulation. Believe it or not, Calgary has been outshot 22-21 in overtime. Given all the extra space and skill no the ice, it defies explanation. Never mind just slipping into the playoffs, home-ice advantage is looking very realistic thanks to how pedestrian the Pacific Division has been. There's still a lot of hockey to go but as absurd as this sounds given they were the NHL's worst team just one week ago and have an NHL-low five regulation wins, the Flames have put themselves in a position to have a decent shot at second in the division. 2 points behind 2nd place Arizona. Flames hold 1 game in hand. 2 points behind 3rd place Vancouver. Flames hold 2 games in hand. Lance Bouma (broken leg) continues to inch closer to being ready to return. When he is ready, to make room for him on the roster, Calgary will have to make a roster move and it will likely be getting rid of one of the current forwards. In this piece on the weekend, I ranked the five most likely options to go. At the top were Mason Raymond and Josh Jooris in that order. But that was before Raymond played his fifth straight game and scored his second goal of the season. Meanwhile, Jooris sat out his fifth straight as a healthy scratch. The more the line-up continues to stay as it's been, I'm now starting to think it's Jooris that has become the guy in real danger. After the game on Saturday, Hartley acknowledged that Raymond has been playing well on the line with Mikael Backlund and Michael Frolik. "I like the chemistry that he has with Backs and Michael Frolik, there's lot of speed on that line, there's lots of offensive skill and it was a great play by Frolik to intercept that pass and jump on that two-on-one and that execution was all on speed," said Hartley. If it does end up being Jooris that gets put on waivers, would he get claimed? I think it's doubtful as most organizations have similar players already. Even if he does, it sheds a contract and his role could be replaced by one of Derek Grant, Garnet Hathaway or even someone like Freddie Hamilton -- older brother of Dougie -- who has been playing well at Stockton. The last five games taught us a lot. I'm curious what we will learn during the next five games. Calgary begins a four-game road trip on Tuesday night that features stops in Nashville, Dallas, St. Louis and Detroit. Then they're back home to play Winnipeg next Tuesday before the Christmas break sets in. That's a pretty tough schedule with four of the opponents residing in the powerful Central Division. The Flames are playing better than they did in October and the early part of November, for sure, but they're not playing nearly as well as their recent record shows either. It's hard to figure out what they'll do this week other than to expect the unexpected, which seems to be the one thing we can count on. Regardless, it sets up to be another entertaining week with this enigmatic hockey team. Don't you dare touch that dial.